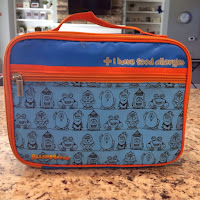 One morning a few days ago, Bubs and I got into an argument over his lunch box. See, he normally takes his lunch in his soccer lunch bag, but since I used a flat rectangular container to pack his lunch this day, I packed it in his Food Allergy lunch bag. 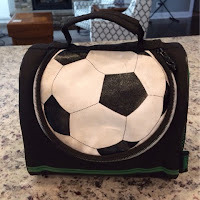 The past several months he has requested that I use his soccer lunch bag, and I have willingly complied. But there are days that it is more efficient to use a rectangular lunch container which fits so nicely in his food allergy lunch bag. On those days, Bubs will tend moan and groan a bit, but he doesn't usually put up too much of a fuss since the content of the lunch is something he desires. On this day, however, he got quite snotty with me and argued over and over that if his lunch was in that [food allergy] bag, he wasn't going to take a lunch at all. I was very proud of myself for remaining calm during this argument and questioned why he wanted the other lunch bag. He was unable to give me a reason, but he was fired up. I told him that I was going to walk away from this argument to give him time to calm down and collect his thoughts. I said that I am willing to hear his reasoning and make accommodations if appropriate. But the way he was talking to me was unacceptable, and I was not going to listen to that tone of voice anymore. As I walked away from him, he made some rude comment to me (I don't even remember what he said). That was it. Conversation over. I told him that he was being disrespectful, and his lunch would remain as packed. He then refused to take it. I told him over and over that he would be hungry at lunch time. He said he didn't care. I said that that was his choice. At no point did I take away his food. I have never withheld food as a punishment. His lunch remained on the counter until he was well on his way to school. Only then did I put it in the refrigerator to save for later. Come lunch time, my phone rang. It was the school. All you food allergy moms know how your heart skips a beat when the school calls, especially when it is at lunch time. But this time I figured the call was about Bubs not having his lunch. Sure enough. I explained the situation but was met with resistance. I was told that kids are not allowed to be at school without a lunch. They asked if he could eat anything at the school. I told them no. They said they had already tried to give him food, and all he would take was an apple. He later told me that they made him eat the apple. I don't have a 504, just an understanding that he is to only eat food that I have approved. (This will need to be discussed further with the school.) Of course, an apple is apparently harmless to him, but who knows what that apple has been in contact with. Someone could have made a peanut butter and jelly sandwich just before picking up that apple to hand to him. I told them that he had refused to take his lunch, it was his decision. They said that kids just can't refuse to take a lunch. I asked how I was supposed to force him to take it. This went on and on, back and forth. Food allergies aside, this was a parenting issue and a learning moment for him. He is almost 10 years old and old enough to understand the consequences of his actions in this type of situation. I fully understand where the school is coming from making sure that kids don't go hungry and are well nourished. There are many kids who receive their only nutrition at school. This child is not one of those kids. And this school knows it. He is a fourth grader, and this is his first missed lunch. Ever. Probably his first missed meal. Ever. I refused to bring his lunch to school that day. I was at a Mother's Day Celebration with my 4 and 5 year old girls. Taking this phone call in the middle of that activity was disrespectful enough. I certainly wasn't going to leave them to take Bubs his lunch when the whole purpose of this was to teach him a lesson. Later that night, as I was tucking him into bed, I asked him why he doesn't like that lunch bag. He finally broke down and said that it's "because it advertises that I have food allergies and that everyone already knows I have food allergies and I don't like having food allergies." I asked if anyone ever makes fun of him at school for his allergies, and he said no. But this is obviously a deeper issue than just his lunch box. I told him that I completely understand, and we don't need to use that lunch box anymore. I also told him that if he had calmly explained that to me that morning, I would have switched things around for him to allow him take his soccer lunch bag. I like to always be positive and excited about the fun things we do with food because of the kids' food allergies, but it still gets them down. It breaks my heart that I can't fix this for him. All I can do is listen to his concerns and do my best to help guide him through this. I try to make life as "normal" as possible, but he will always be different. Until there is a cure, he will always have to bring food from home just about anywhere he goes. I think ahead to dating, college, etc. It is all possible, but there is lots of effort involved. Lots of patience and planning ahead involved. I just hope to be a positive influence on him in regards to food. Not only for safety, but for health and wellness as well. It's funny that I make such a big deal about raising awareness about food allergies, and all he wants to do is fly under the radar. He just wants to fit in. Different perspectives are important to recognize and acknowledge. I will never stop fighting for him, but I will also do my best to make him feel as normal as possible. I totally agree about the apple. People think it's so innocuous, but they are often-times waxed with coatings and as you mentioned, could have been handled by someone with allergen-laden hands, etc. Add to the mix the children with apple allergies... There are no "simple" foods when a child has food allergies!